I seem to specialize in cute Halloween crafts. Any attempt to make anything spooky, scary, or creepy ends up cute. I just can’t pull off scary. I don’t even try any more. 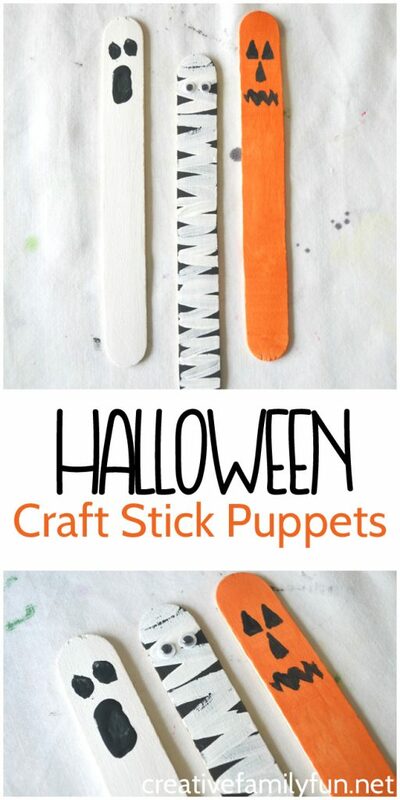 These craft stick Halloween puppets were destined to be cute. Plus, they’re quite easy to make. 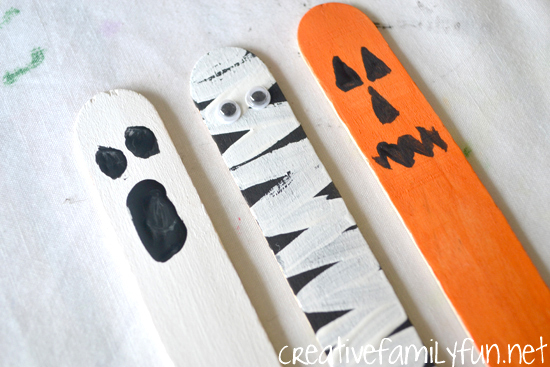 All you need are a few craft sticks and paint… and don’t forget the googly eyes! Keep reading and I’ll break each of the puppets down into step-by-step instructions. 1. Paint your craft stick white. 2. Add two small black circles for your eyes. 3. Add a larger black circle for your mouth. To help with the details, use the smallest paint brush you have for your black paint. Using a large paintbrush will make it hard. So, the smaller the paint brush, the easier to paint the details. 1. Paint the craft stick black. 2. Use your white paint to paint zig-zags along the length of the entire craft stick. Make sure to let a bit of black peek out between your stripes. 3. Add a couple of small googly eyes to finish your mummy. If you don’t have googly eyes, use your white and black paint to make your eyeballs. 1. Paint your craft stick orange. 2. Paint 3 small black triangles for your nose and mouth. 3. Paint a black zig-zag line for your mouth. Once your paint dries, your Halloween puppets are ready to play with. We’ve got several of these floating around the house and a few are currently haunting Cinderella’s castle. She’s not scared.